Save any large output as an .rds or .RData (if you can afford) to your hard-drive, clear your environment and start the next step with as low of a RAM footprint as possible. My key-learning of this post, however: If you’re on Windows, set-up a Linux distro to dual-boot. R is so much more performant on Ubuntu et al. (also with regards to Unicode, path length, memory management and much more) You’ll start the environment with at least 1GB more of free RAM; you’ll have full CLI control over the swap drive/file; and then some more. ##  "Threads for Quanteda: 4"
Since we’ve already pre-processed the Internet Research Agency dataset, we can just load the exported data object and go on with corpus-building. 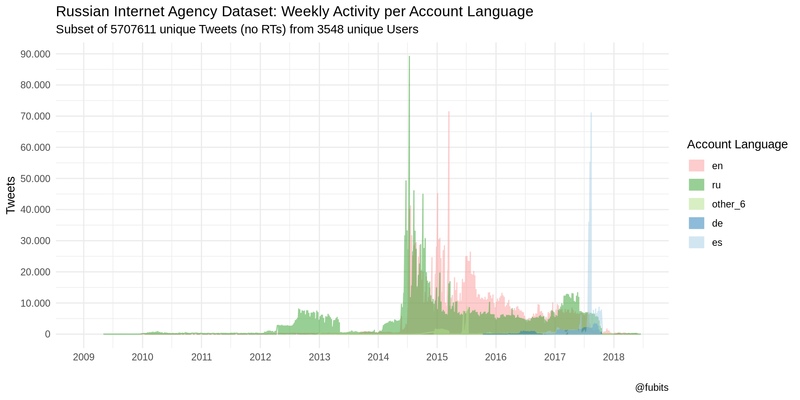 As I didn’t do this in my last post, let’s have a quick look at the time-wise distribution of Tweets in total, and grouped by Tweet and Account languages. This way, we might see what time periods and what languages might be worth special attention. First, we’ll reduce the observations to language groups and further aggregate on a weekly basis. 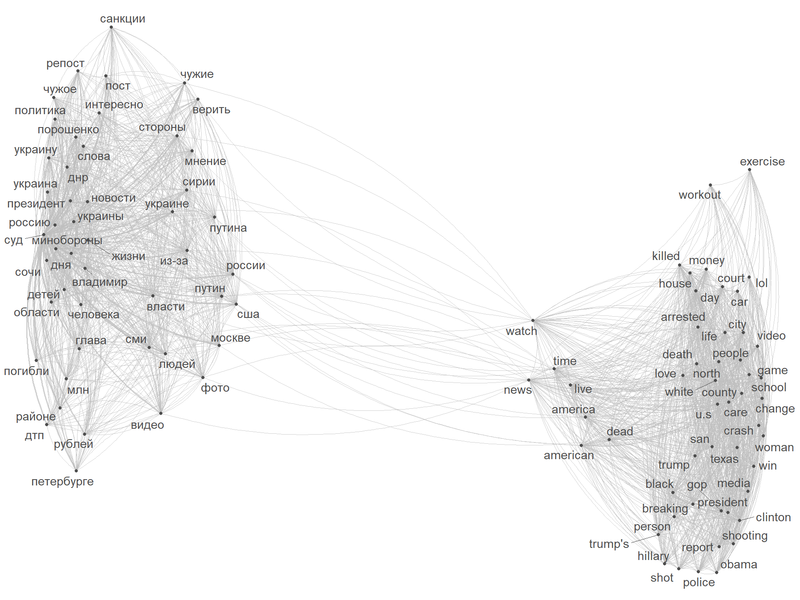 Now we’ll plot time series grouped by account languages. Well that’s some interesting peaks - first “ru”, then “en”, than a little phase with “ru” followed by “es” (as in Español)! We can neglect everything before 2012 for now, so the following plots should become a bit more detailed. Let’s see what we can observe by plotting the Tweet Languages and inspect the top peaks’ dates. 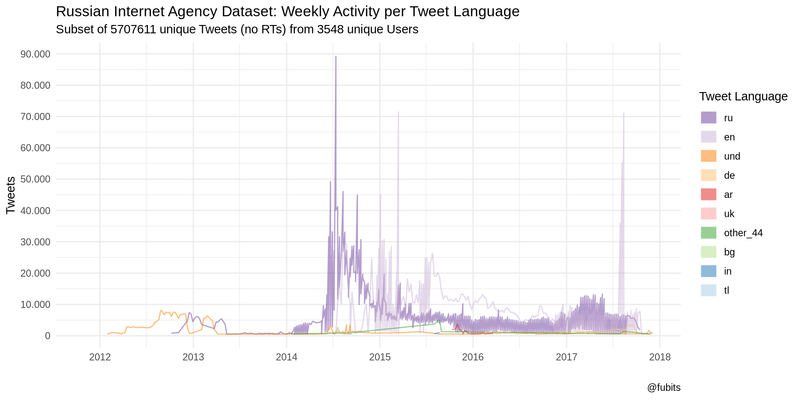 To further reduce noise, we’ll filter out languages with less than 500 Tweets per week from 2012 on (as we have aggregated the Tweets on a weekly basis, in fact, only week-wise values will be filtered out). 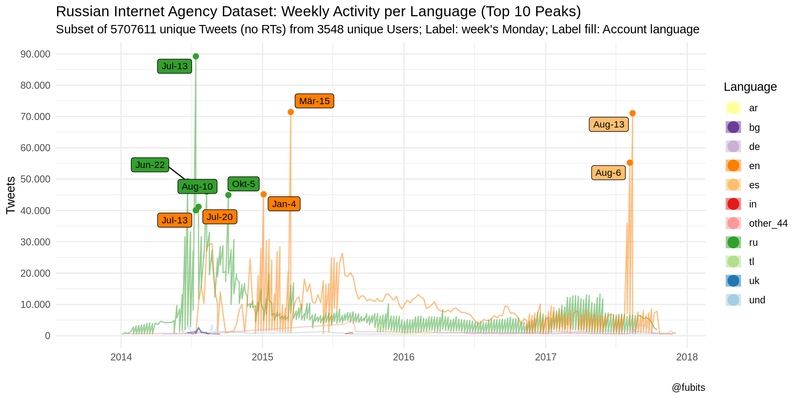 n_distinct(data_unique$userid), " unique Users", "; Label: week's Monday; Label fill: Account language"
Technically, we could re-do this for all peaks of any particular Tweet or Account language and find out more about the particular events (i.e. German-language Tweets peaking around the Federal Elections in autum 2017 - barely visibly with this color palette) with the help of Wikipedia’s super-handsome current events portal. post-Maidan, the Ukraine-Russia conflict just entered a full-fledged armed conflict period, complemented by Russia’s Annexation of Crimea et al. on 17 July Malaysia Airlines Flight MH17 was shot down over Ukraine (cf. Bellingcat’s OSINT work). well… and on 16 June 2015, Trump announced his presidential campaign. on 12 August 2017, “fights break out between white supremacists and counterprotesters in Charlottesville, Virginia, over the removal of the Robert Edward Lee Sculpture.”2. As we can see, the activities really peak around certain events, either concerning US-American left-right clashes and other intra-state affairs, or they concern topics with Russian involvement. What’s striking, however, is that the days around the infamous Brexit referendum (23/24 June 2016) are among those time periods with the overall lowest activies. Alright. Point made. Let’s continue with preparing our automated content analysis. We’re going to build a corpus from our dataset, turn the corpus into a sparse Document-Feature Matrix (DFM), reduce unnecessary features (words/tokens) from the DFM and then use the DFM for Structural Topic Modelling. Now we can explore some specific keywords and their full-text conetxt, i.e. those where we can already assume that they should take up a prominent spot in the corpus. We’ll put the keywords into a (kwic()-friendly) vector and then do a single run with all keywords instead of repeating this n-times. This will take time and might not work properly without enough RAM. This was the moment where I arrived at my individual “too big for in-memory” point of failure - even with 16GB RAM. After trying out some memory.size() tricks on Windows, among other things, I decided to change my OS (for R at least) to Ubuntu (MATE 18.10) and set up dual-boot. My first motiviation was to reduce some memory load (i.e. Skype, iTunes, Office et al. all helpers running in the background). Eventually, I had to extend the “in-memory” capacity by creating a dedicated 64GB swap drive on a USB 3.0 thumb drive. As soons as I get hold of a new, bigger, and faster SSD, I’ll have a look at the performance of a SSD-based swap drive. This is not as many results as I would have expected. However, this might have been caused by me by not explicitly defining the search pattern as “glob” or “regex”. I’ll re-do this post with better equipment soon-ish. them on the list too . They’re the colluders with soros . The Spanish-language dominance in 2017 looks really weird. Hm, does not look too Spanish to me. That’s another topic for further exploration and investigation. From a tactical perspective with regards to large corpora and in-memory processing, this particular Stack Overflow introduced an interesting but actually misleading approach for creating a huge dfm: 000andy8484 - Create dfm step by step with quanteda. After failing to build a dfm from the untouched corpus repeatedly (on Windows & Linux), this SO-post explained how to reduce the number of features in the corpus by tokenizing the texts and removing unwanted tokens before creating the dfm. This way I really gained some momentum for dfm() (by reducing dimensions), but we would also loose the analytic methods / functionality of a corpus object (i.e. kwic()) as we destroy the basic corpus structure (full Tweets in our case) by replacing the texts with tokens. This experiment was more of a performance evaluation than a recommended practice (for now, at least). 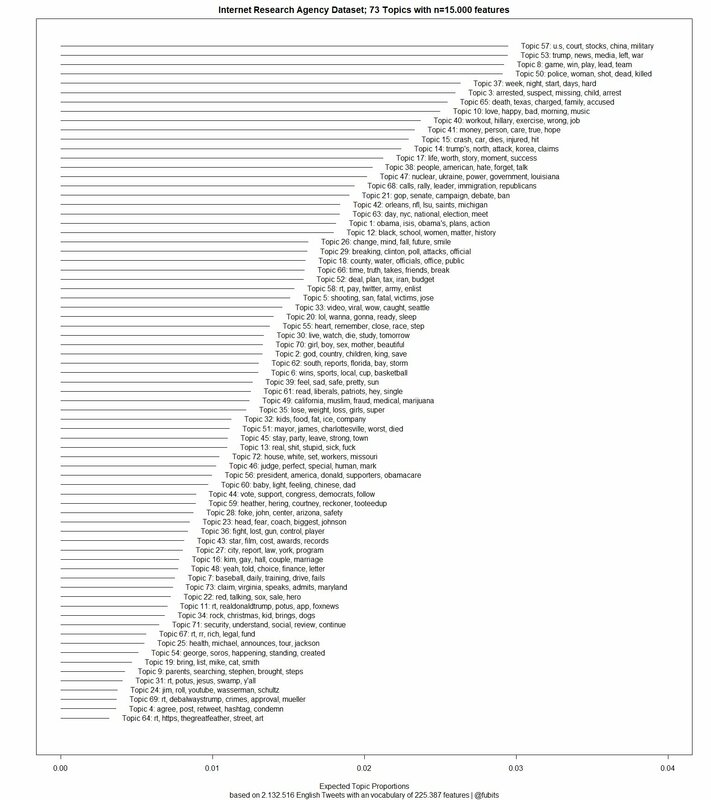 I ended up with something like a 60M x 1.5M DFM, which obviously shows that I had lost the document-based corpus structure. First of all, we will need to create list of very frequent tokens/words which we can simply filter out from our corpus. This is my current best-practice with regards to stopwords. I’m using three different sources to compile a super-list of stopwords for the languages concerned. (As for “amp”, this is an artifact I encountered in my previous posts: It’s just a left-over of &amp, which is the HTML entity for string-parsing &, and is created when we use remove_punct = TRUE. Same is true for &quot and probably some other unparsed/escaped entities in the IRA dataset). Caution: This is the taboo-approach, which I tried out and would not recommend re-doing. It performs. But the analytical value/utility of the output is rather limited! This task alone would first approach taking up more than 20GB “RAM”" on my Windows OS Laptop and eventually crash, so be warned again: proceed with caution! We already have a plain, untouched corpus object from further above, so we can skip this step. Now we’ll turn the international corpus into a sparse Document-Feature Matrix / Document-Term-Matrix with quanteda::dfm() and include n-grams of 1 and 2 words (bigrams). gcinfo(TRUE) # sets gc() to verbose = TRUE; even when output == "FALSE""
Success! Thanks Linux! But don’t forget to save this dfm object!!! Now we’ll make sure that there are no left-over 1- and 2-character tokens (which are called features from now on) and then save the dfm to our HDD. 5708124 x 1530058 sparse DFM (4.5K features less now). Holy sh*t. That’s the power of R + Quanteda + Linux I guess. So my “little” proof-of-concept experiment worked out. You can build a large dfm from a large corpus without resorting to cloud computing / AWS et al. Now we can explore a bit more and then proceed over to building a topic model. Funny! 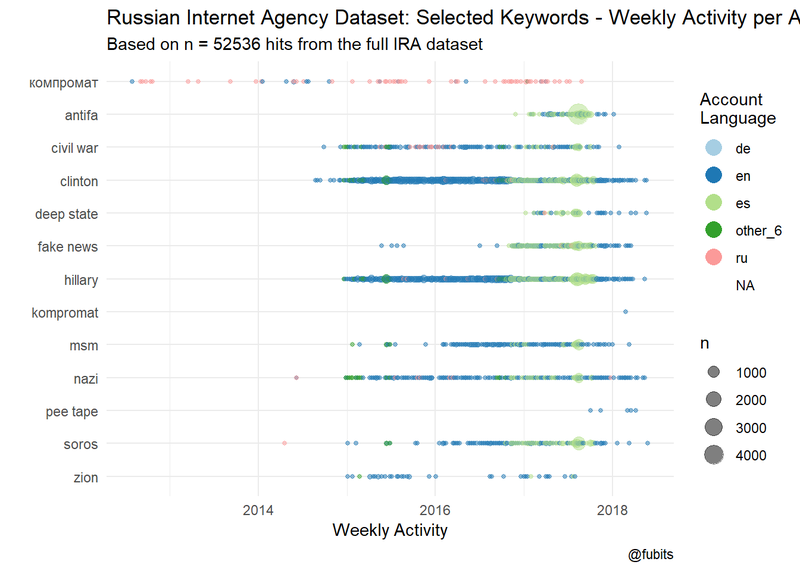 Russian terms dominate the international corpus aka Twitter’s “Internet Research Agency” dataset :)What’s also noteworthy, is the top-ranked news hashtag, probably pointing at the proliferation of the “fake news” term. Now let’s create a subset of our dfm without #hashtags and @account handles for a purer content analysis. It’s a bit redundant, but due to the (in-memory) size of the full-languages dfm (2.8GB with hashtags/accounts; 2.7GB w/o) this is necessary if we want to work with and without Twitter artifacts. This is another good moment to restart our session with a lower in-memory footprint. Now we can have another look at the top features from our dfm, this time without hashtags. While the default scheme = "count" would give us the absolut/total feature frequencies (i.e. 3x news in a single Tweet = 3x news in absolut terms), scheme = "docfreq" returns per-document frequencies (number of Tweets with this feature), which is more precise with regards to Tweets. Wow. Russian features concerning Ukraine, Russia, and USA still dominate the top features in terms of frequency! for orientation: this is the order of languages in this table (can’t get them to render as col.names = with knitr:kable() yet):"ru", "bg", "en", "und", "other_44", "de", "uk", "tl", "es", "ar", "fr", "in", "sr"
Mind that I only removed stopwords for Tweets labelled as English, Russian, and German (by Twitter). As we’ve explored in the previous post, und (=undefined) mostly containes Tweets in Russian. What’s interesting is that Bulgarian as well as Ukrainian both predominantly contain Russian features, with Russian orthography, which should not be the case here. With the mightiness of Quanteda, we could do a lot of further exploratory analysis and so on… However, it’s really about time to focus on a smaller and language-specific subset, as the following task (to be addressed in part #3 of this series) will be even more intense in terms of computing power and memory usage.